When reading the travelogue: click a picture and it will be increased. 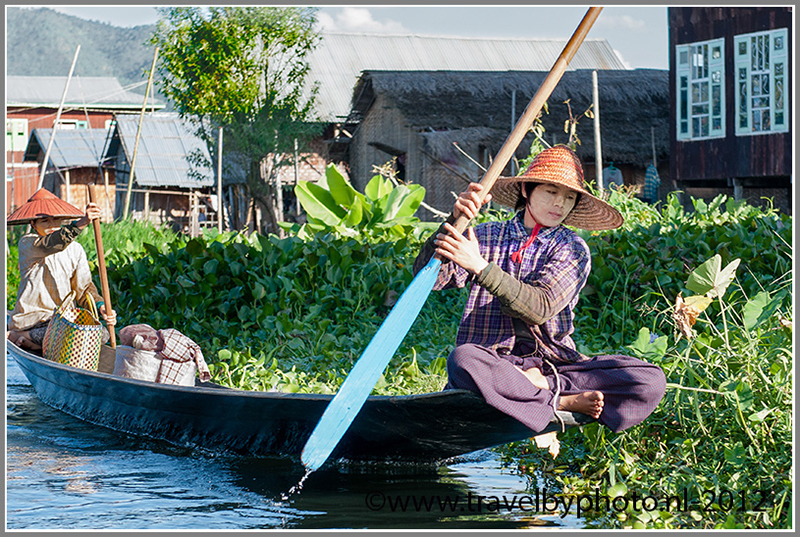 If you see a link, like: Khiri Travel: click on the link and it will be opened. 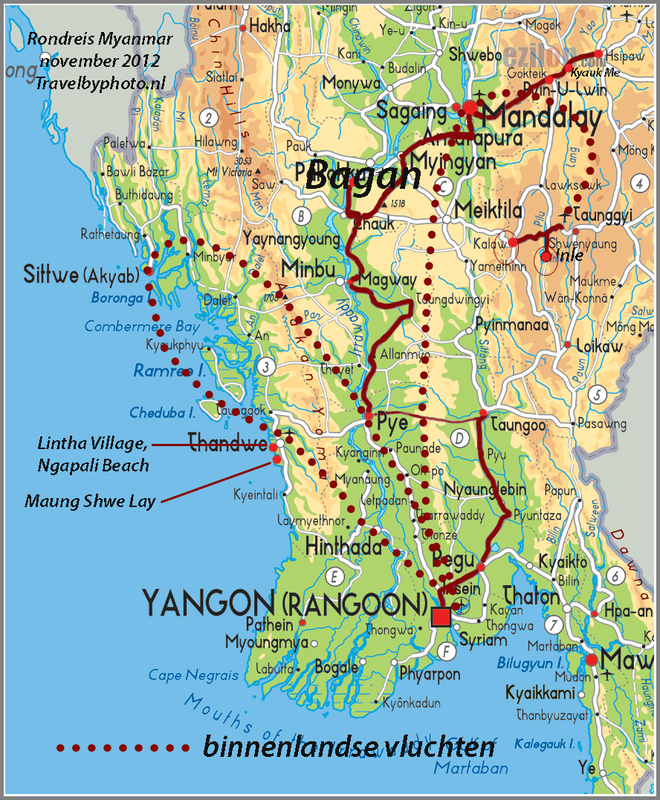 When referring to a map of Myanmar/Burma, the map can be accessed by clicking on the link Map of Myanmar. The clips (images with an arrow) that are included are HD recordings. The clips can be viewed in a separate window that automatically opens when you click on the image with the arrow. English is not our native language, so we apologize in advance for translation- spelling- and grammar errors. 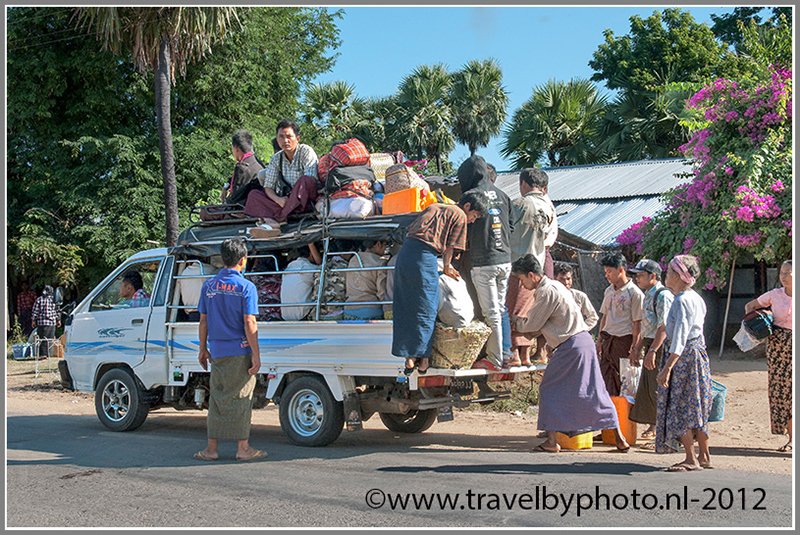 After experiencing the sunrise in Bagan we continue our ride to our next destination: a stopover in Mandalay Map. En route we notice a peanut plantation. We stop for a visit. 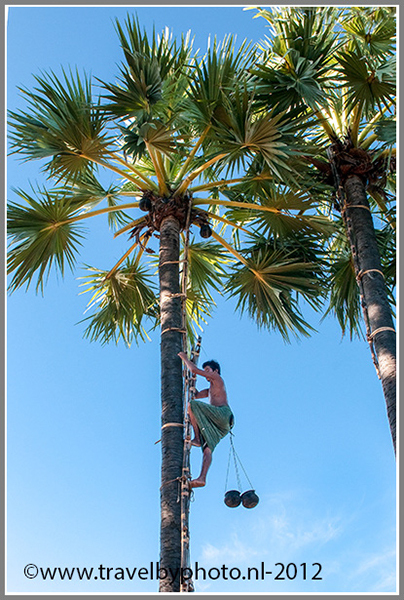 A man climbs to the top of a palm tree where he makes notches in the crown. He drains some sweet liquid from the tree that is used to make Spirits. 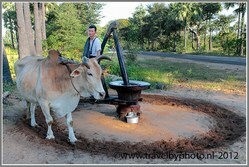 There is also a bull attached to a millstone strolling around in a circle pressing oil from the peanuts. 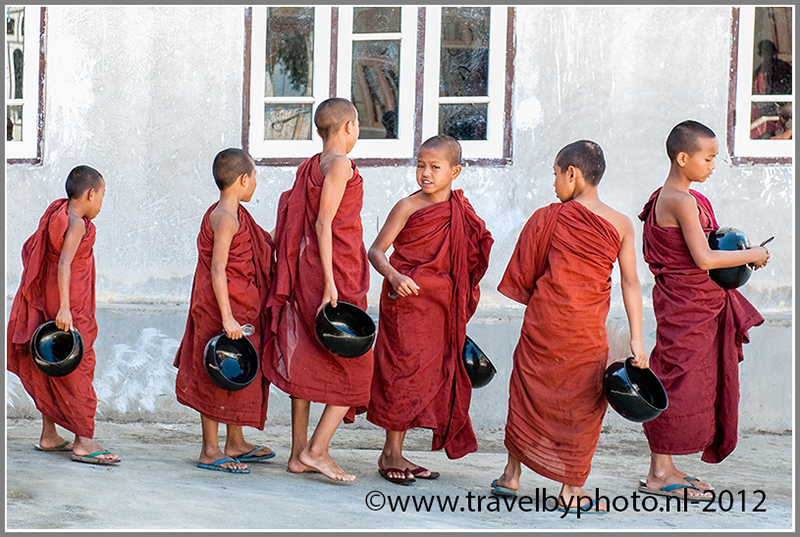 We are told that November is a month with many celebrations for the monks in Myanmar and our chauffeur Aung Win has heard that there will be a ceremony in honour of the monks in a village nearby. So we leave the main road and drive to the village of the monastery where the ceremony will to be hold. En route we pass a truck loaded with local residents who are travelling to the same village for the same ceremony. 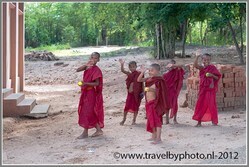 In the village is tribute to the monks honor and respect by the laymen. The monks are loaded with money and presents. The people at the monastery are all very friendly. They enjoy smoking a cigar together! There are also a few old men in traditional costume with the hair worn in a bun. 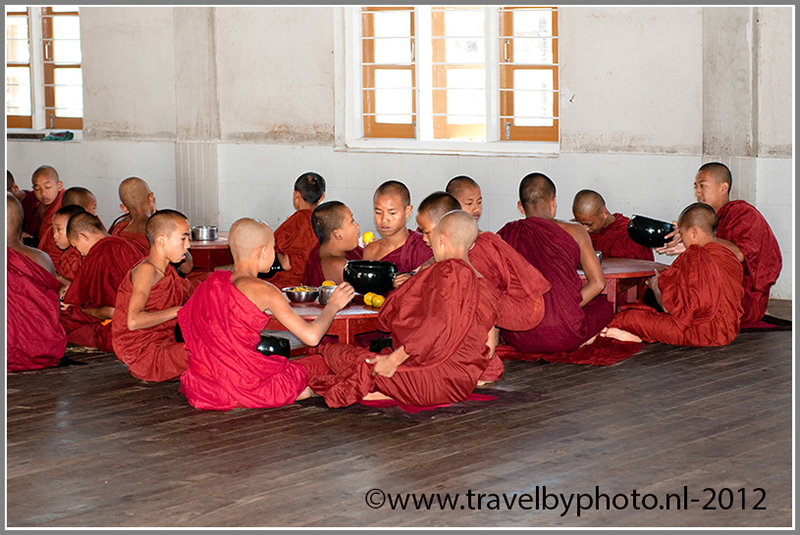 As sign of gratitude from the monks , the monastery provides the locals a meal that they eat together in an community space. 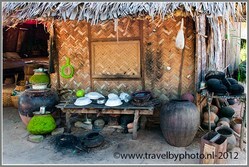 At the back of the monastery is in an outdoor kitchen were another meal is prepared, especially for the monks. 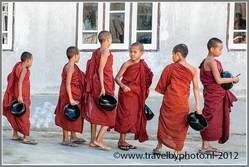 We are invited by the monks to join them. A very special experience. 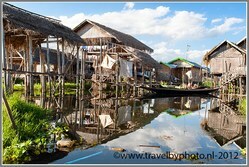 As we return to the main road we pass a compound. 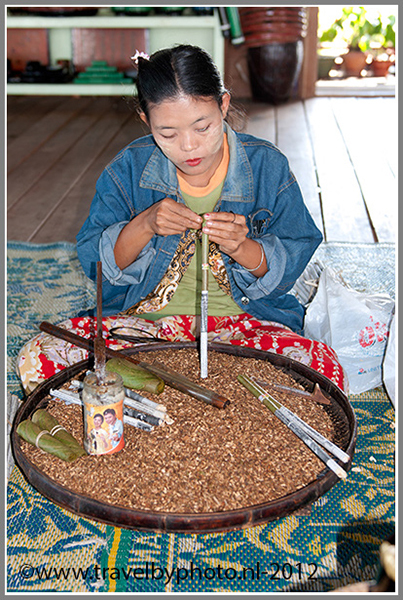 The women of the compound are busy peeling peanuts. A sweet lady, 82 years of age, asks us to join her for tea and biscuits. We do not speak the same language, but her invitation and company is so hospitable; heartbreaking. We see many beautiful old jars scattered in the compound! Stone pots filled with water. The water remains cool in these jars who are beautifully weathered and often covered with moss. After our visit to the compound we drive to a market. We see a market saleswoman grabbing extensively between intestines and pig ears ...bah! It is very busy. Buses run to and fro. 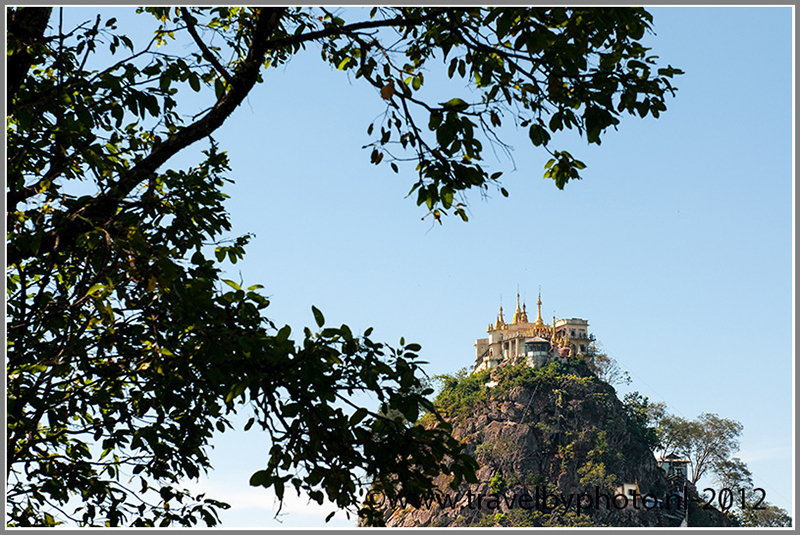 We drive past Mount Popa with its fairytale golden buildings on top. 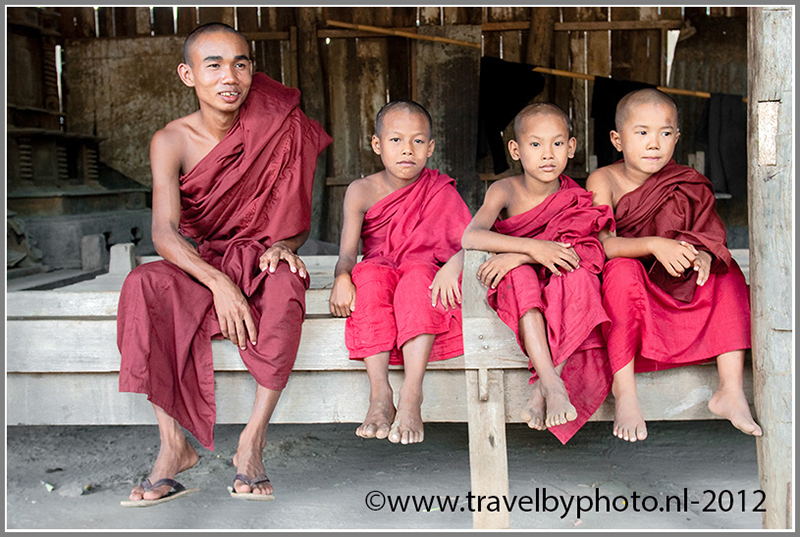 We didn't see much monkeys in other parts of Burma, but here there are a lot of them. 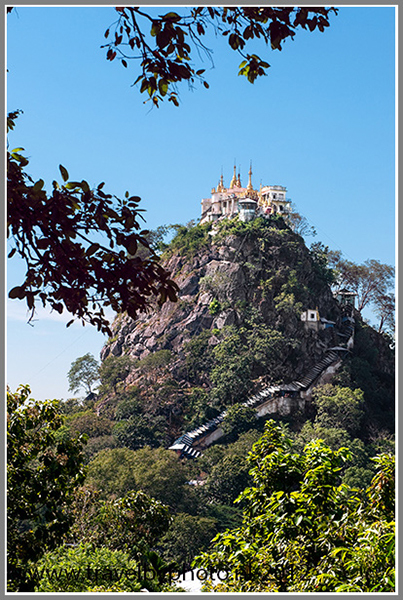 We don't fancy to climb to the top of the mountain. It is crowded, the time is wrong (middle of the day), it is hot and Jan-Arend is in a poor condition. He has no fever anymore, but still has an annoying sore throat and a dry cough. 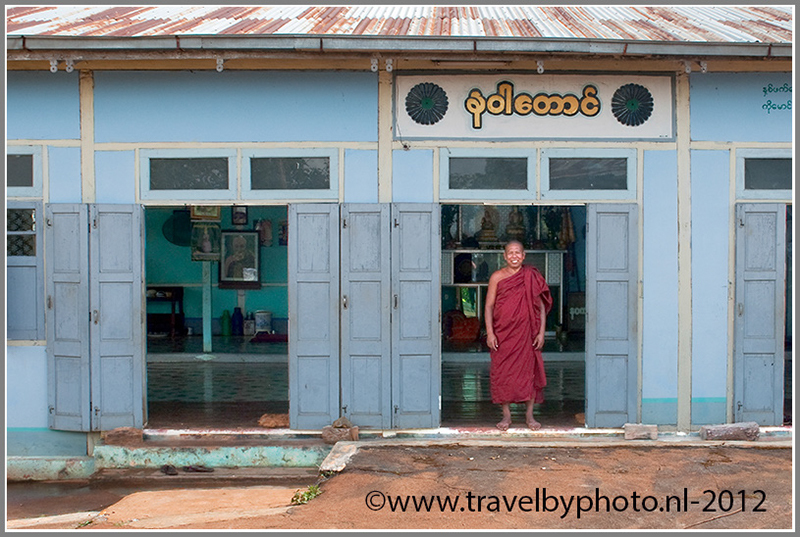 Instead, we drive on and stop at a small very old village-monastery along the road. As soon as we show our faces, two young monks come rushing towards us with chairs for us to sit on, but we want don't want to sit. We want to walk around. There is so much to see! We give the monks, still children, some bouncing balls, and when we leave, everyone is playing with the balls! There is no good restaurant in the surroundings of the hotel. That is why we decide to eat at the hotel. A lucky choice. The food (fried vegetable rice) is very tasty! At 6 a.m. we enjoy a good breakfast in the hotel. For a moment we think that they have brown whole wheat bread for breakfast, but it turned out to be Chocolate bread. We are brought to the airport in a luxury four wheel drive car. Nice ride. Unlike Yangon there are a lot of mopeds on the road in Mandalay. Some with entire families on it. 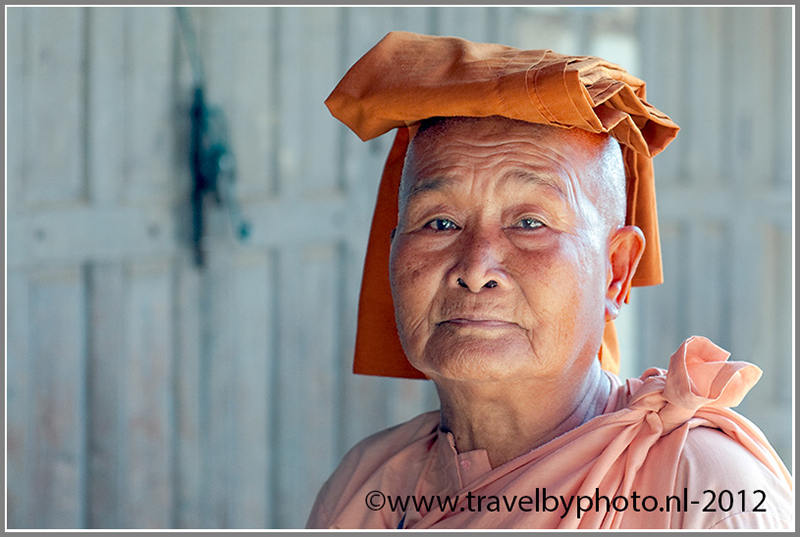 We see small vans filled with monks and bullock carts crossing the highway. Service on the airport is good and fast. No strict rules for baggage and a sticker on your lapel to identify which flight is yours. You can't read the bulletin boards, if there are any, on the airport. The sticker identifies the flight you are booked on so the staff can warn you in time for boarding if necessary. Easy but clever system. It's a short flight to Heho; 20 minutes! We fly in a Fokker (a plain build in Holland; always special for us Dutchmen). At Heho airport we have to wait for a while till we are neatly picked up by a guide and driver. 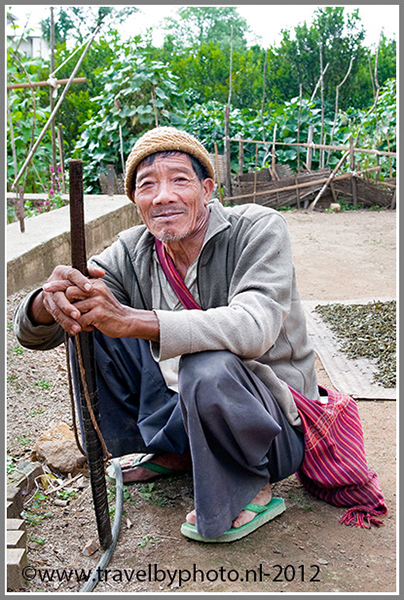 We drive to Kalaw (detail kaart). In earlier times Kalaw is used by the English colonists as a Hillstation. 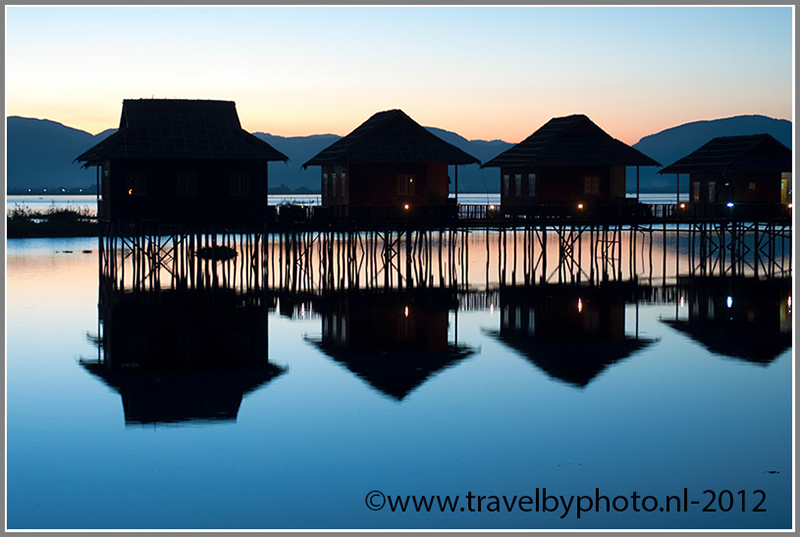 Due to the cooler climate in the hills it was an ideal place to escape the heat of the summer. 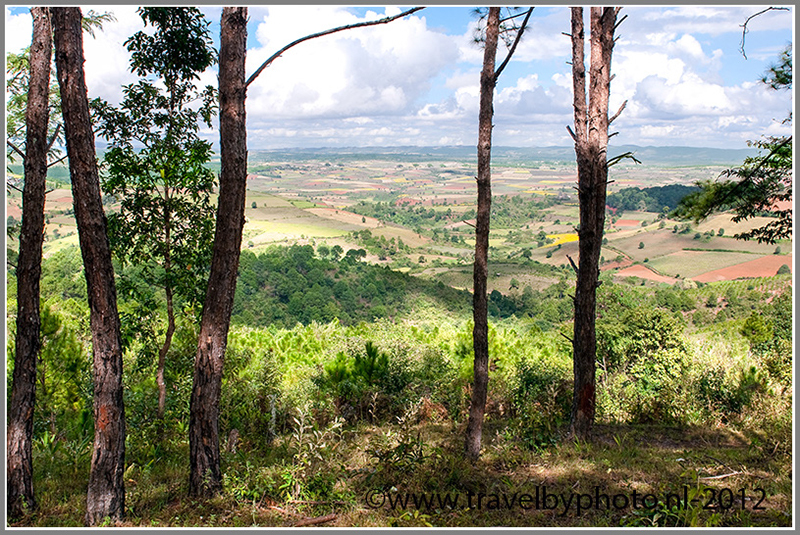 We drive through a beautiful hilly landscape with scenic views. As we drive up the trees give way to conifers. The earth is brown/red of colour and there are many yellow mustard seed fields. The temperature is pleasant. 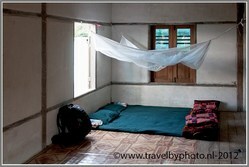 Our hotel in Kalaw is:Honeymoon Dream Villa Strange name for just a hotel, but the room is fine. All wood. The people of the hotel are very friendly! After lunch we walk to the village. That's not far, but there is not really much to do in the village. There is a market that is only partially open. We drink some tea and walk back to the hotel. Jan-Arend - still a little ill - goes to bed. Ingrid reads a book on a porch swing outside. After breakfast we leave for a two-day trek. We are picked up at the hotel by car. We are brought to the starting point of our hike. 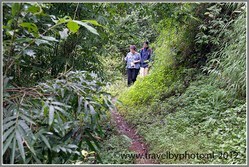 There are three guides walking with us so we won't get lost! 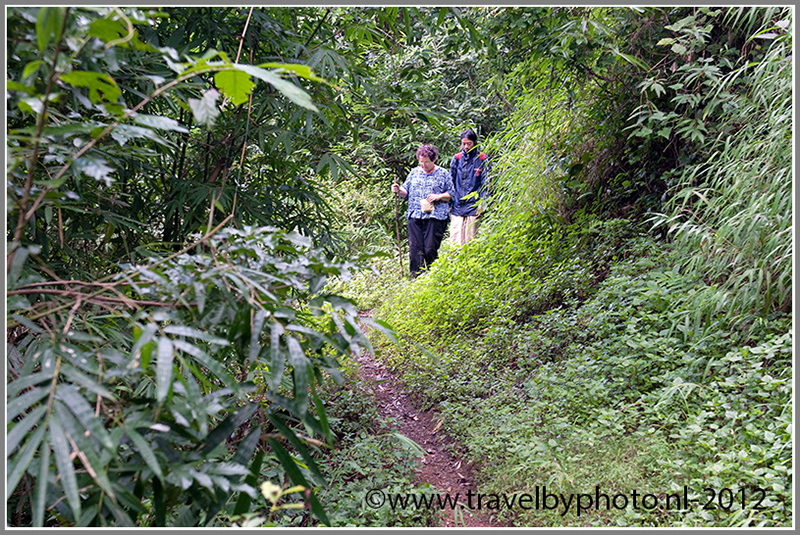 In the beginning our walk runs down, but it doesn't take long before the track leads steep uphill! We have lunch at a monastery. We have to wait quite some time at the monastery before we continue our hike. Therefore we look for a nice spot in the shade to take a nap. We meet another couple in the monastery that is hiking too. They are from Switzerland. Nice people. At 11.30 am we continue our walk to a second monastery. 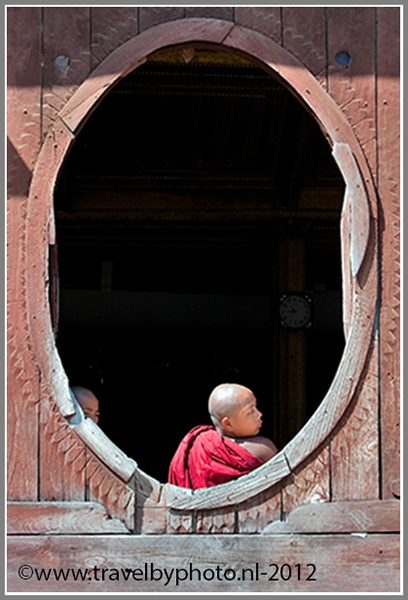 Unlike other monks we met until now the monks of the second monastery are not so sympathetic. They are much to themselves and very taciturn. 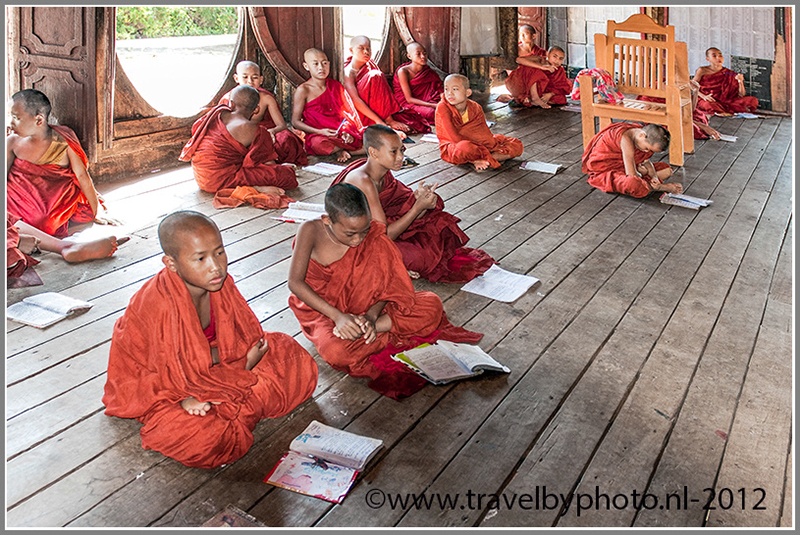 The monks make no effort to make contact or to set you at ease. We feel a bit of an intruder, while still, we will spend the night here. The village itself is also not that exciting. 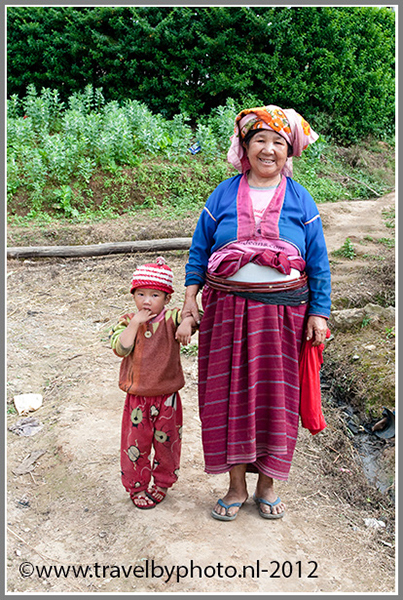 In the description of the trek was written that we would be invited to help the women of the village preparing a traditional shared meal. Like a mini cooking course Burmese food, but that was not true. Jan-Arend still has fever and Ingrid has considerable burden of her intestines. We rest till diner. At 7 pm diner is over. It's dark and there is no electricity. We chat for an hour with the Swiss before going to sleep. 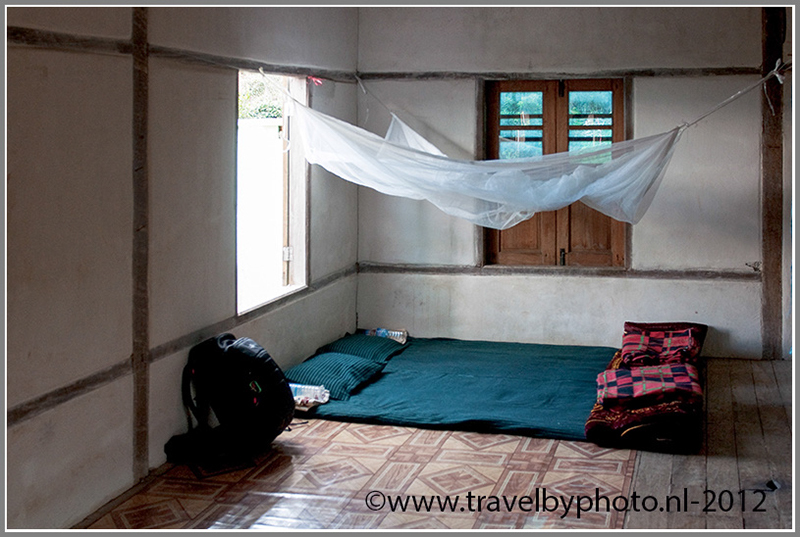 We sleep on the ground in a large room next to the monastery. .
Ingrid awakes at night. When she is turning over in bed she feels .... it goes wrong! Her sphincter has failed to do its job! In total dark - a flashlight is hard to find when you're in a hurry - without her shoes on - standing somewhere outside - she hurries to toilet - also outside at some distance from the dorm. On the toilet, in only a faint gleam, she tries to repair the damage. What to do with the dirty pants? No t dustbin, plastic bag or something. Necessity knows no law ... with a firm swing she launches her underpants in the distant bushes. Even without feeling guilty! What a poverty, what a mess! 7.30 am we start walking again. For Ingrid a real torture! The first 50 meters are fine, but then we arrive at a very small path approximately 25 cm wide. The path goes incredibly steep down. It rained last night, and it's slippery. It is more stumbling and slipping than walking. The profile of our boots are filled with clay after just a few steps. We walked for hours and hours. Meanwhile the area of course is very beautiful. Very green, like a jungle. Many flowers and - especially yellow - butterflies. Step by step we move further down. We have to watch every step because before you know you slip away and you constantly have to lift your foot high, over bamboo stems, stones, and so on. The guides are super friendly. They carry our bags and help Ingrid reaching a hand as she threatens to fall. The intestines of Ingrid meanwhile still protest vigorously. Her sphincter loses the battle every time she slips away or has to make a crazy movement. When we are down and think the end is near, we reach a river, where we have to wade through for over an hour. There is no path so we have to drift from one bank to the other side, over wet stones back and forth, again and again to our knees through the water. Wow this is no hike, but an unannounced survival trip of the most vicious kind. We are exhausted! This tour is definitely not recommended after rainfall. 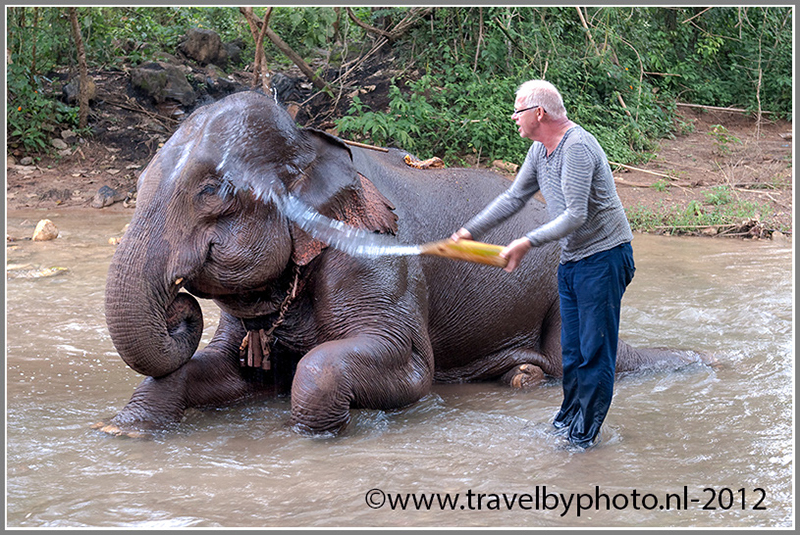 Eventually we see two elephants bathing in the river. They belong to a elephant relief camp . There are seven elephants in the relief camp. Elephants are very sweet animals. 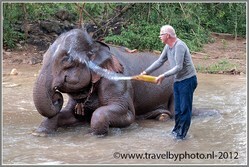 We give them bananas and wash them by splashing them wet. The elephants really seem to enjoy it. Their bristly hairs are cute, and these big animals act so cautious! The supervisors ask if we want to make an elephant ride but we say no, the elephants are very sweet but please ....... no new adventures today anymore! We just want to go home! As we walk on, our guide informs us that it will still take over an hour to walk to the car from here. As soon as we realize the message they gave us, we quickly climb at the back of the elephant in order to let us carry us through the jungle! It feels good on the back of the elephant. After an hour trek through the jungle on the back of the elephant we finally reach the finish; a restaurant where our car is parked. We have a meal in the restaurant and meet the Swiss again. They are also completely exhausted. Our Swiss friends want to have "tout de suite" a taxi to their hotel. After the meal, we drive to our hotel where we fall into a deep sleep after ..... a hot shower! We are totally demolished! Severe muscle pain and super stiff. At 9 a.m. we are picked up at the hotel by a female guide called Su-Su. It's a nice girl. 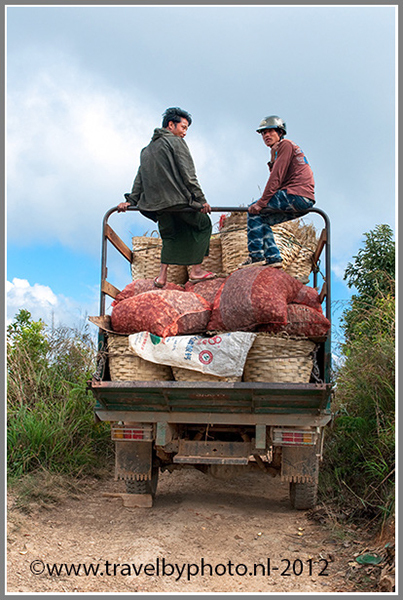 We drive to the market in Kalaw. 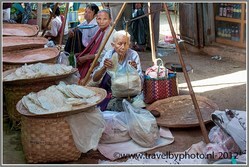 The market is much busier than when we were here before, because it’s the week market today. There are some fruits and herbs that we do not know. Su-su explains a lot. Very informative. We drive on and pass another busy local market. Many horse and carriages here. 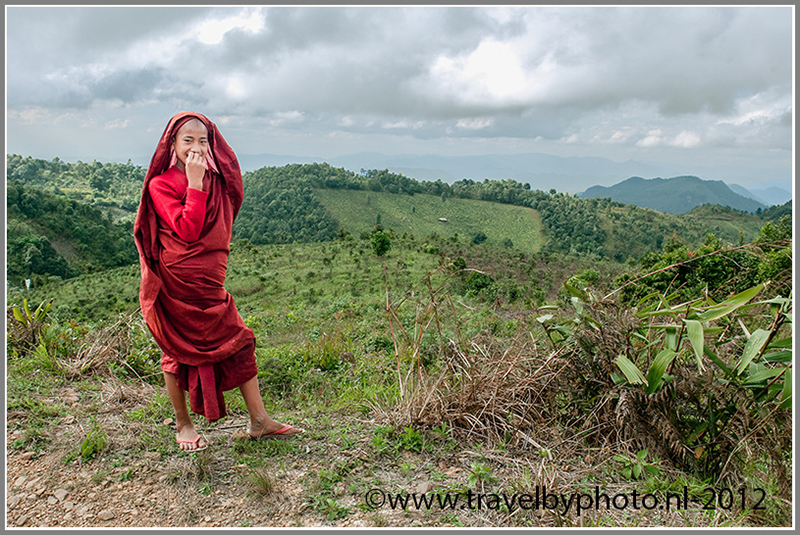 We visit the famous Shwe Yan Pyay monastery. 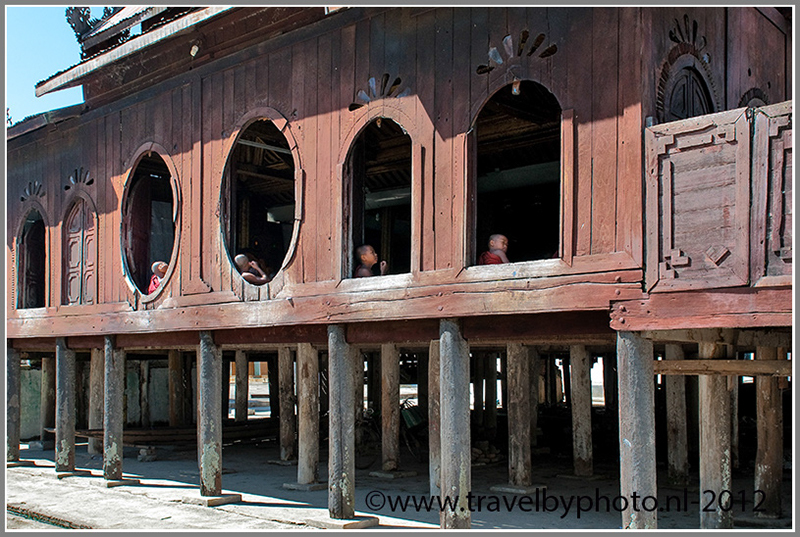 The Shwe Yan Pyay monastery is a more than a hundred years old teak wooden monastery that is best known by its oval windows. 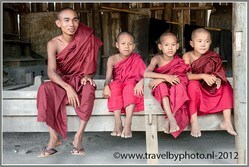 There are many young monks. They are praying and learning. 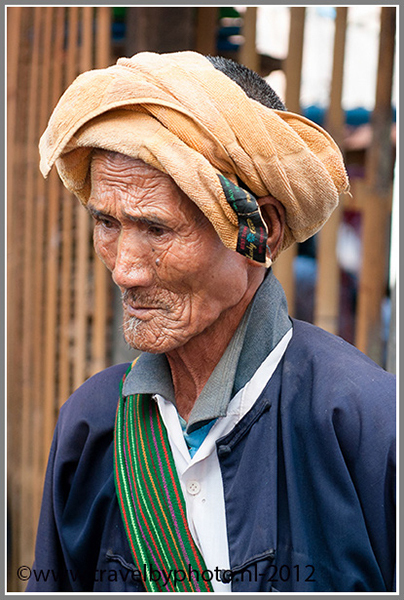 Su-su tells us that every Buddhist male is supposed to become a monk for some time in his live in Myanmar. Boys have to be at last 7 years old and the girls at last 9 years before they can join a monastery. Seven days is the minimum time the stay as a novice. We reach the environment of the Inle Lake so there are more tourists here. The monastery is clearly a popular attraction. A whole busload of elderly Americans is dropped by the monastery. 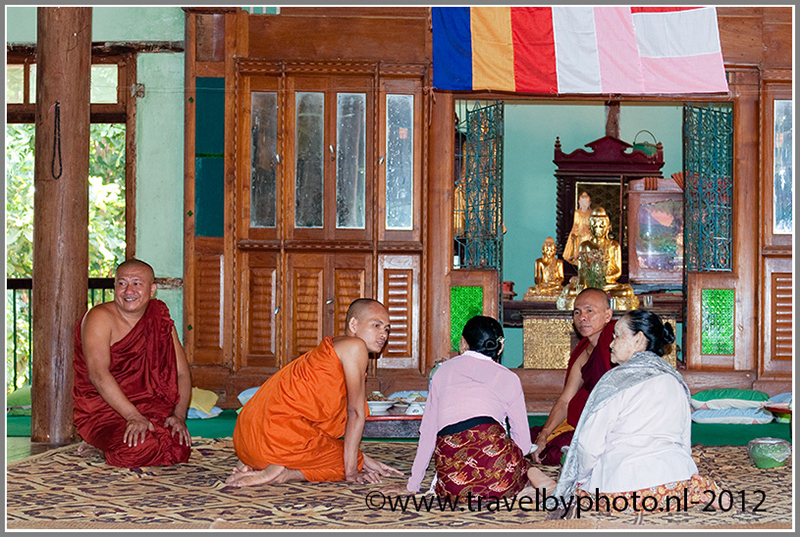 As soon as the prayer hall is filled by more tourists than monks we leave. Nearby the monastery is also a temple with hundreds of Buddha statues in alcoves. 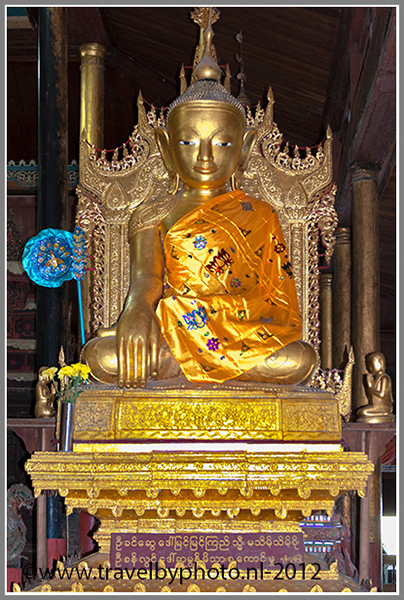 Some Buddha statues are very old. 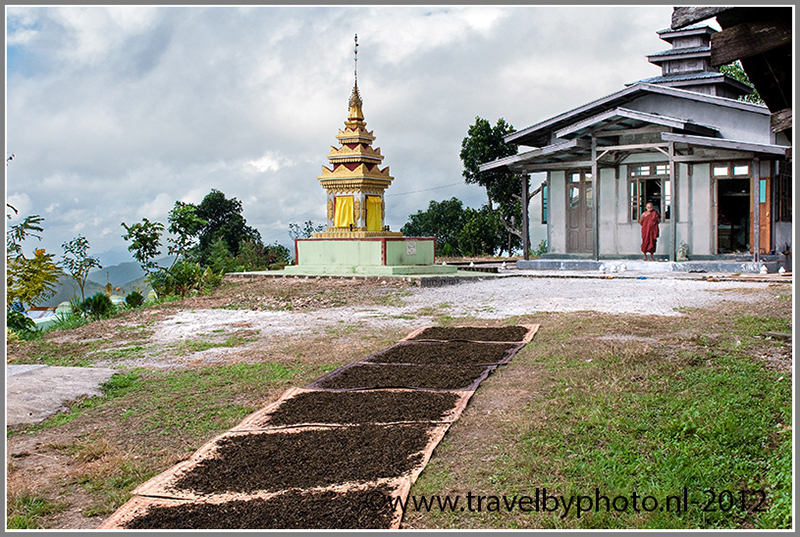 The Buddha statues are donated by pilgrims from all over the world. 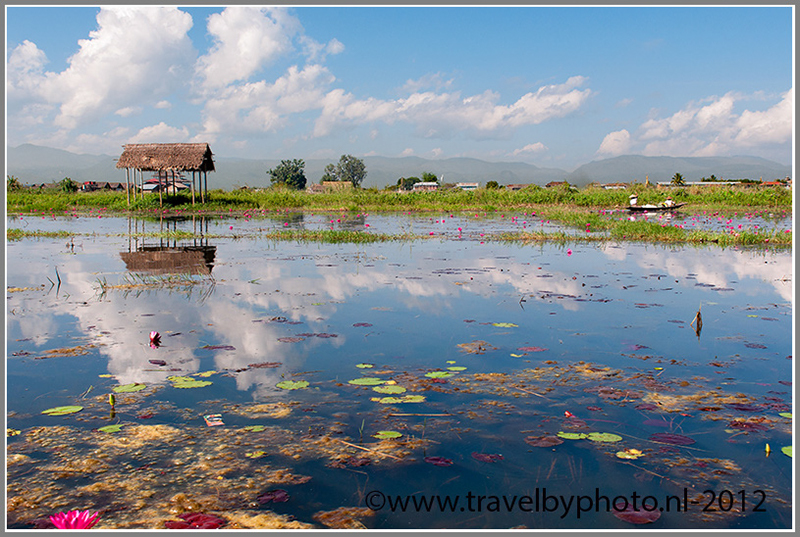 After our visit to the Shwe Yan Pyay monastery we drive on to the Inle Lake. 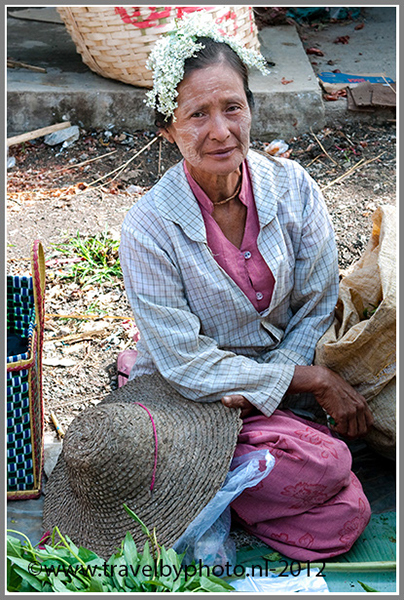 In Myaung Shwe (map) we buy a hat. The sun is bright and hot. The hat provides some extra protection; essential when you are on open water. We board a narrow wooden boat. 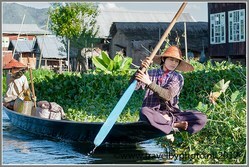 In the boat are some nice simple wooden chairs to sit on. 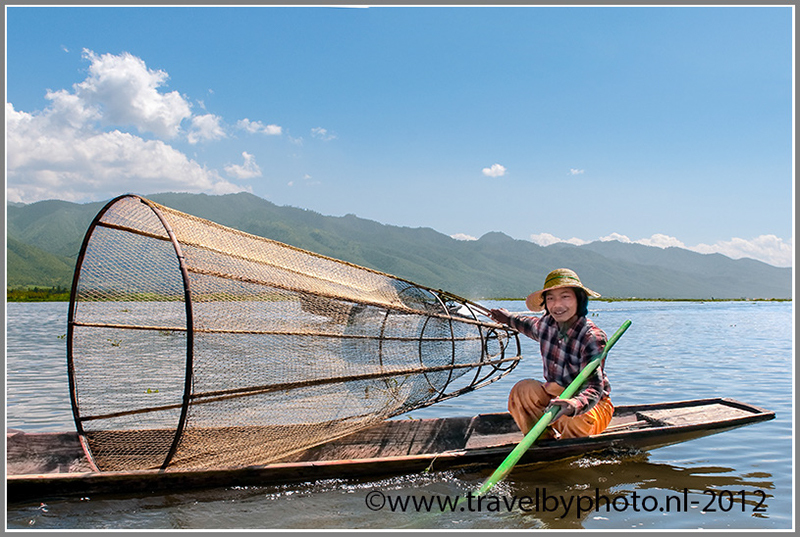 And so, with only the two of us, Su Su and a boatman on board we float away direction our hotel Golden Island Cottages on the lakefront. 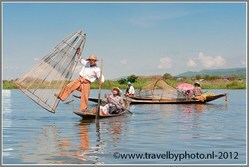 We pass the famous fishermen who paddle with one leg, artfully balancing on a small shallow boat. 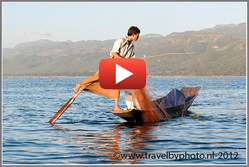 Some fisherman hit with a stick on the water to chase the fish. 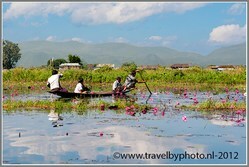 There are many floating plants, it reminds us of South India. The hotel looks very attractive, and we are greeted with music. 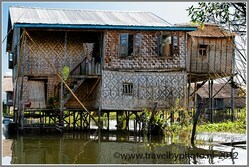 The rooms are like little houses on stilts. The room is spacious and has a terrace on the water. 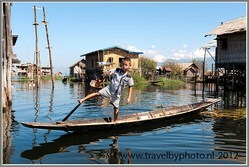 Before leaving with the boat again, we refresh ourselves briefly in our room. 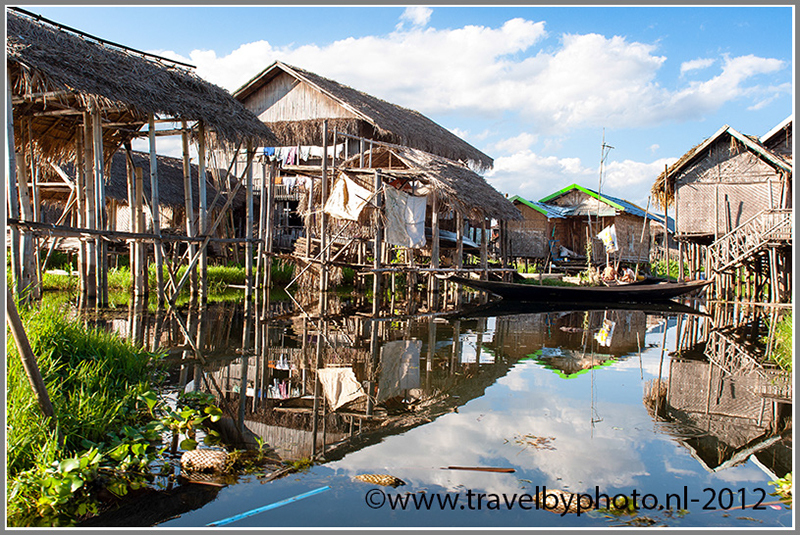 Everything in this area is transported by boats. The boats sometimes sail very hard! All the houses are on stilts and there are floating gardens. Stunningly beautiful all. We have lunch with Su Su and enjoy all the boats passing by while we eat. 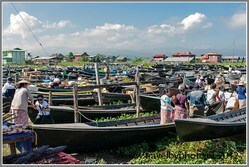 Boats with children who are brought to school, with women on their way to the market and monks going to the monastery. 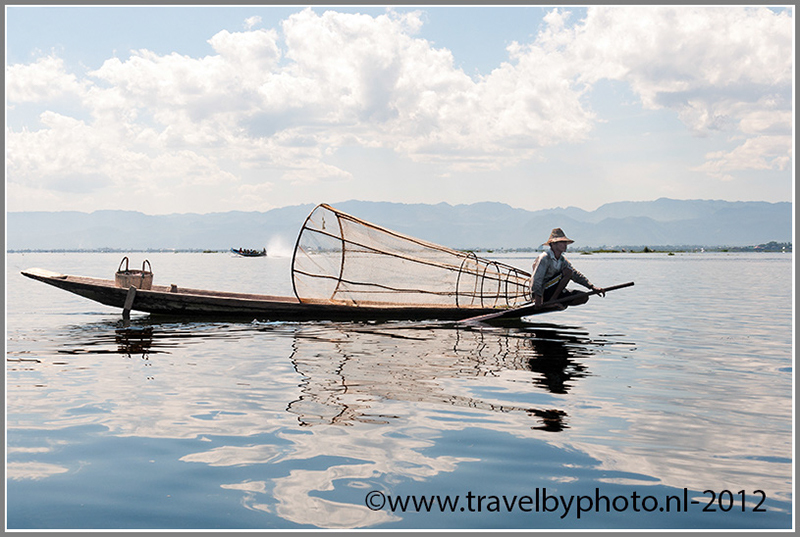 Most boats are long and narrow. 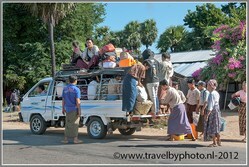 They usually cannot carry more than 5 persons. We visit a place where they create paper with flowers in it - like hibiscus - processed from the environment. Everything is done by hand. After a good night sleep we have a nice and quiet breakfast at 7.30 am in the hotel. After breakfast we return to our room. 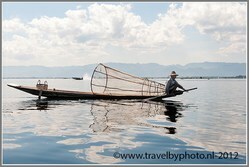 We have agreed with Su Su that she will pick us up by boat at 9.30 am so we still have some time to ourselves. Back in the room we feel the earth move heavily, our room on stilts over the water shakes violently and the electricity fails. Jan-Arend think it's an earthquake, but is that true? We have never experienced an earthquake before so we cannot identify it with certainty. Ingrid thinks is more like a big boat floating by but if we look outside, there are no boats nearby . Instead we see many air bubbles emerging from the lake. Very strange, such a tremor that persists much longer than can be explained. 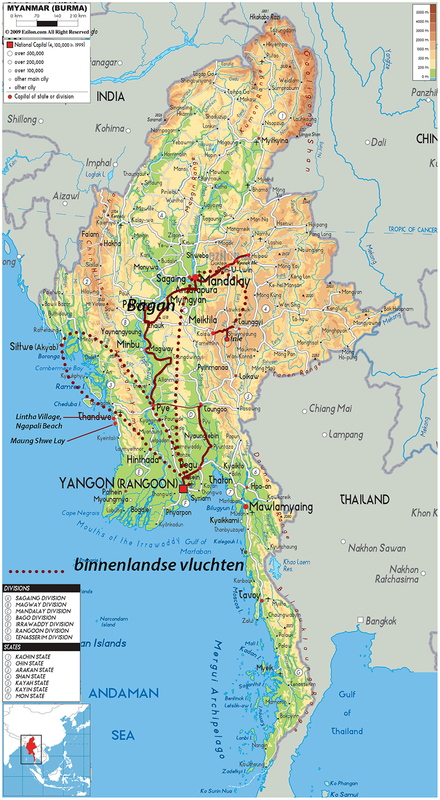 Later that day we learn that Myanmar indeed has been hit by an earthquake at a depth of nine kilometres, 135 kilometres north of Mandalay with the force of 6.8 on the Richter scale! There are even 10 deaths to mourn and quite a few injuries. Bizarre of course that we also have felt the earthquake and that the epicentre was not that far away! It is still a bit cloudy when we leave the hotel with Su Su. It is the beginning of a great day on the water today. We enjoy everything we see. 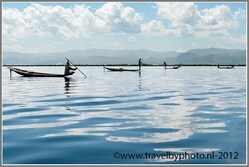 We are surrounded by boats with hard-working fishermen on it. 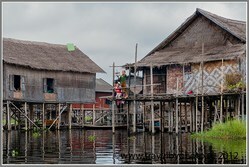 We pass floating gardens and plantations with tomatoes. The sun slowly breaks through. The skipper anticipates on what we want. When he sees us grabbing to our camera he immediately slows down the boat and provides us the opportunity to take photos and film. 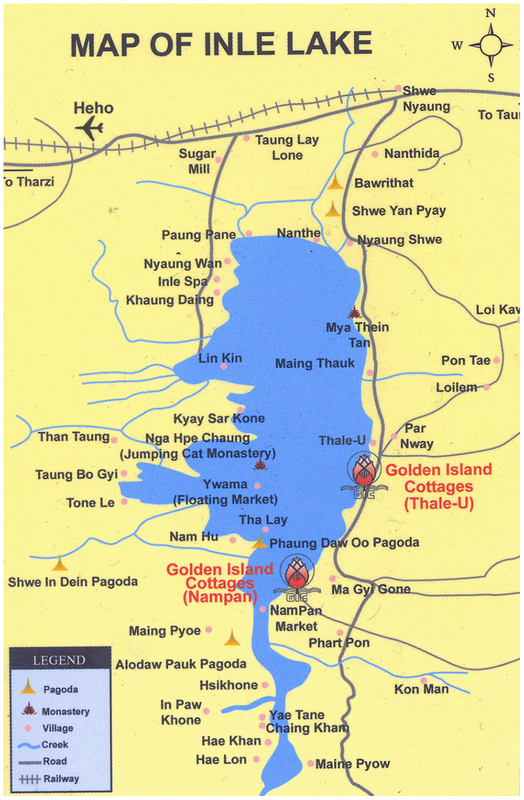 We go to the market in Nam Pam. 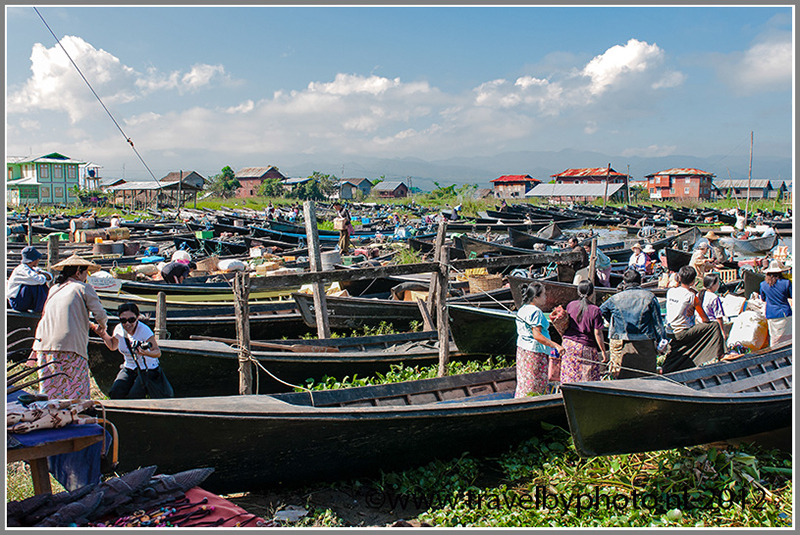 There is a cycle of five day markets; each day there is market in a different village on the lakefront. Sailing through the villages is cute. Children playing, kiting, swimming and paddling on small boats, bamboo houses, sometimes very much skewed, laundry drying on lines. The whole environment smells of water, flowers, herbs and a hint of diesel. When we reach the market, we climb out of the boat. Fortunately, the muscle pain is a lot less then yesterday. 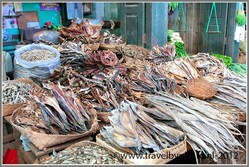 On the market is a big area where they sell bamboo stems that are used for homes and floating gardens. 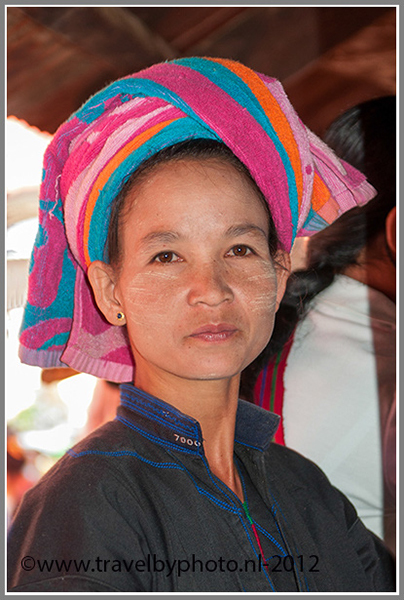 The people do not wear distinctive traditional costumes, yet many women and also men of the Intha tribe who inhabit this area wear a towel as a turban on their head. Su Su really adds a lot to our visit to the market. She explains patiently all kinds of food, fruit and herbs. Many different types of noodles and rice cakes. Suddenly a pig pops up from under a stall causing excitement. There is a stall with medication, and so on. It's a nice market. As we leave the market we pass fields of lotus flowers in water. The temperature is fine. A nice gentle breeze blows over the water. 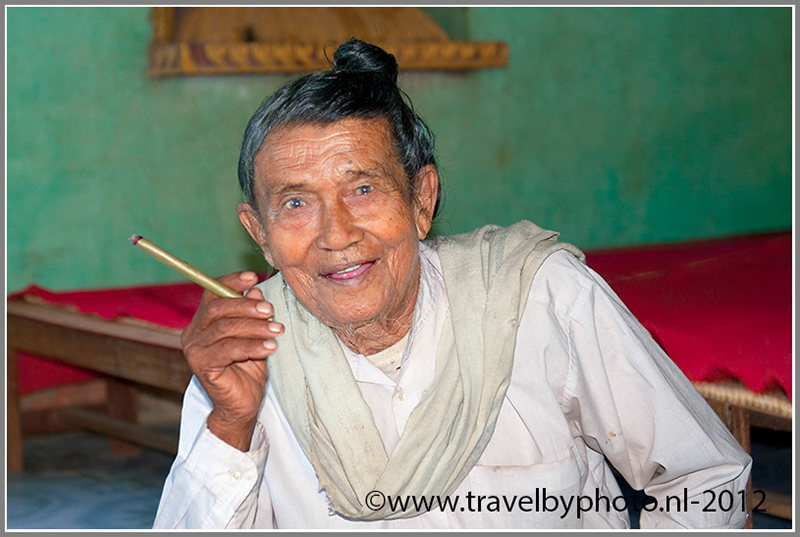 We visit a smithy, a cigar factory and a large weaving mill. Many looms with women at work. it is very noisy. The bobbins in different colours shoot with tremendous speed back and forth. They even make fine and expensive yarn from the steals of lotus flowers. 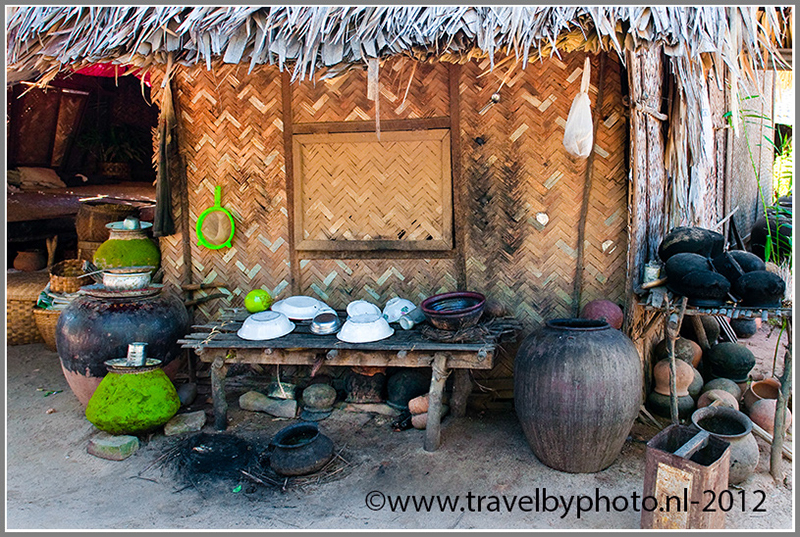 At noon we enjoy a nice meal in a restaurant where they serve us all kind of different traditional Burmese dishes. Very tasty. 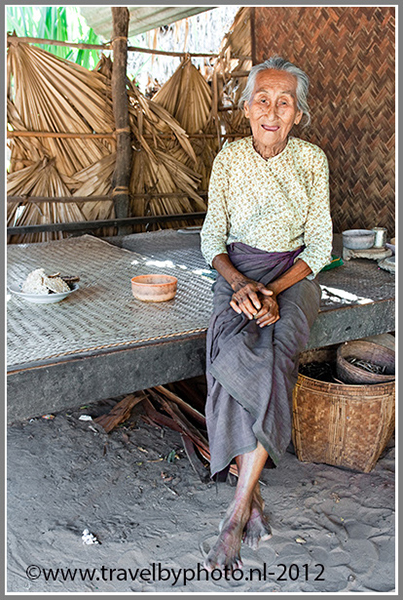 We have an interesting conversation with Su Su about how we and about how she lives. Su Su still lives with her parents at home. The family house is flooded every year. 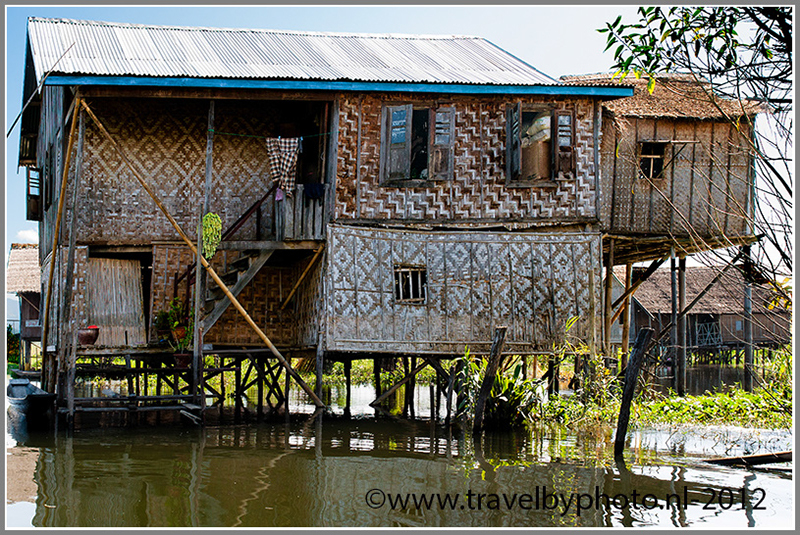 So when it is high water the family needs to leave their home for the house of an aunt who lives at a greater distance from the lake. Su Su works part-time as a schoolteacher and in the tourist season as a guide. 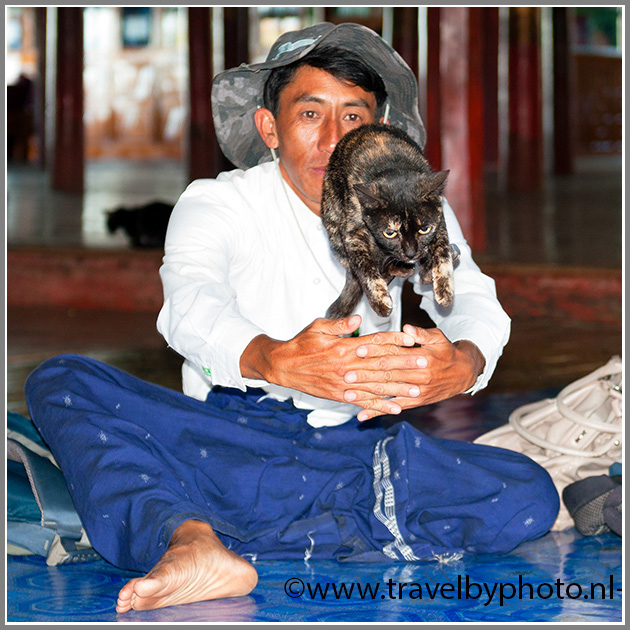 Near the restaurant is a special area where they keep Burmese cats. These cats even have their own island to play on and houses with windows, a door and a staircase! These cats are very spoiled! 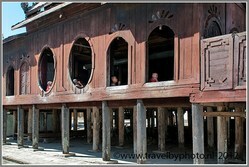 We sail to yet another monastery and stupa. In this monastery there are also a lot of cats. Until recently these cats were very famous because they were trained by a monk to jump through a hoop. 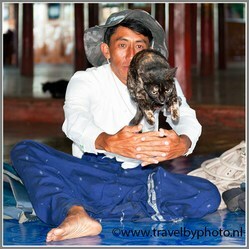 Sadly this monk passed away half a year ago, and now most cats do what they do best: they sleep. 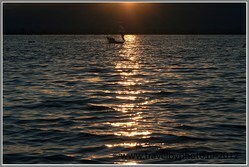 Yesterday we told Su Su that we would love to experience the sunset on the lake. She has not forgotten. At the end of the day we sail on the lake! 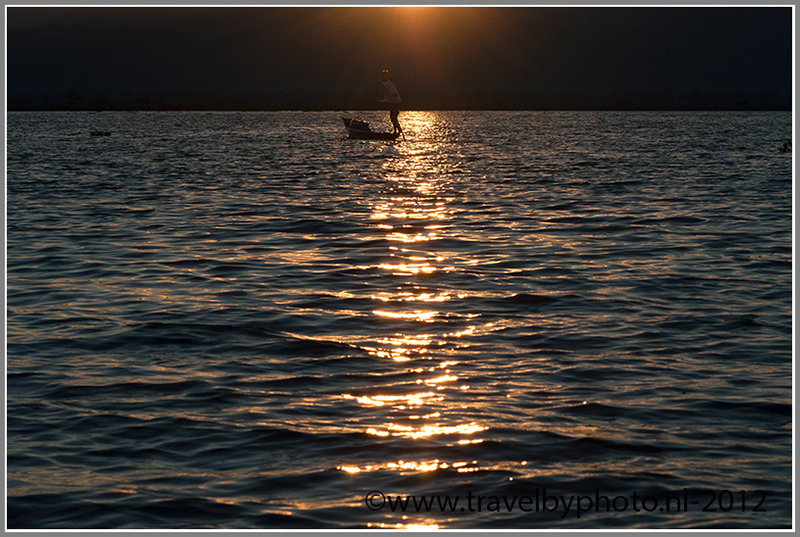 We see the silhouettes of small fishing boats in the golden light and sail along with a fisherman who lowers his nets into the lake for a catch. Magnificent view, magnificent light! Today we have a slow start. We sit on the terrace of our room and enjoy the view. A cluster of hyacinths drives past us. Birds are dancing in the sky. The weather is great; nice temperature. Early afternoon we will leave for Heho airport. 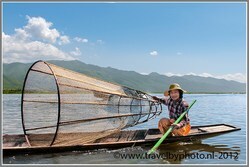 Su-Su will pick us up with the boat again and for the last time we take a peaceful boat trip on the lake. 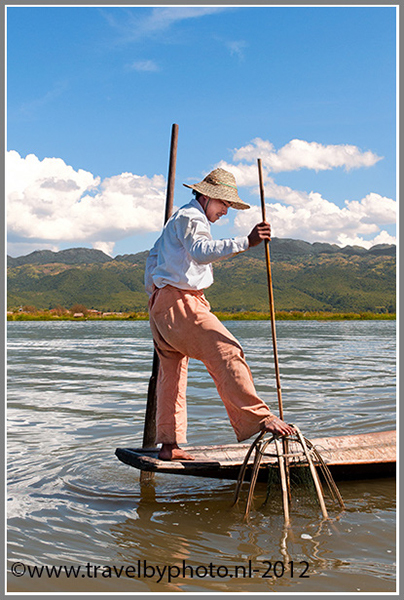 We say goodbye to the fishermen and admire one's more their fishing skills. 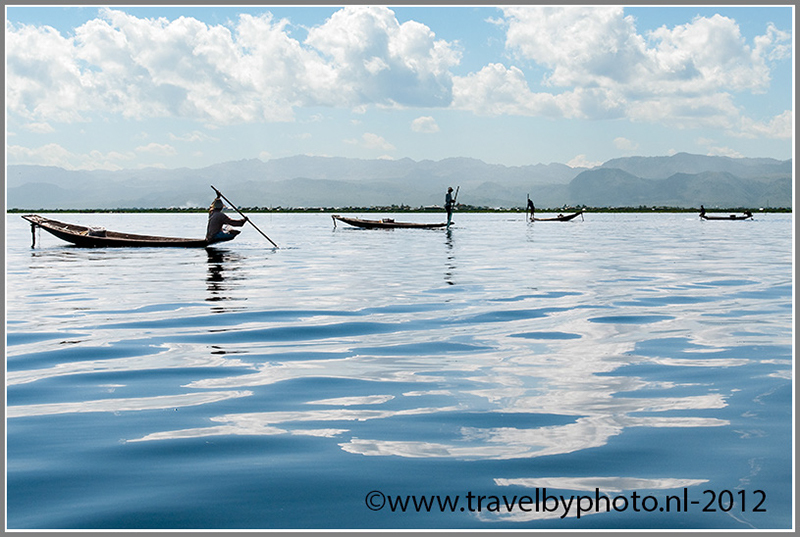 Then we arrive in Myaung Shwe; the start and finish city of our visit to the Inle Lake. By car we go to the airport. The airport of Heho is very simple. We see two boys runing on the runway with a fire hose on a pulley with wheels. Would they have an emergency response training? Would it work? An airplane extinguish with a syringe? Luckily no real disasters happen which have to be intervened. A window in the departure is open. You could jump out of the window and run directly to the aircraft without any problem. But, who would do that here? In the plain, in the chair before us we see a local newspaper from Mandalay in the English language. On the front page is an extensive article with pictures about the earthquake. Bizarre that everything happened so close to us. The damage is much bigger then we heard before. 50 people killed, a lot of injuries, bridges, buildings and stupas collapsed.